The Red Devils produced a disjointed performance devoid of creativity in their second successive draw. Manchester United forward Alexis Sanchez. 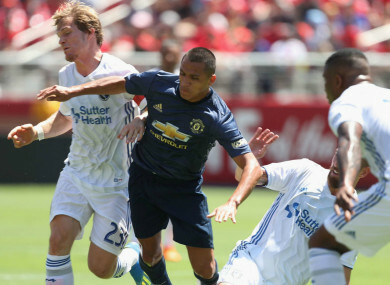 ALEXIS SANCHEZ MADE a timely return as Manchester United failed to impress in their goalless pre-season draw against San Jose Earthquakes on Sunday. Sanchez was unable to travel to the United States with his team-mates after his visa application was initially blocked, forcing the Chile star to miss the club’s opening pre-season fixture. Jose Mourinho was desperate for Sanchez to play, despite his delayed arrival, with so many of his first-team regulars absent ahead of United’s Premier League opener against Leicester City on August 10 following the World Cup in Russia. And Sanchez gave his boss a boost as he took to the field in sunny Santa Clara on the weekend, having only touched down from Manchester on Friday. Sanchez looked lively and refreshed after Chile failed to qualify for the World Cup, but it was a largely disjointed performance void of creativity from the Red Devils in their second friendly at Levi’s Stadium. Anthony Martial, Ander Herrera, Eric Bailly, Antonio Valencia, Chris Smalling and Luke Shaw joined Sanchez in the starting XI, while exciting prospect Tatith Chong was also named in the line-up following his impressive cameo against America. Sanchez was in the thick of the action early, earning a free-kick and delivering a teasing cross that bounced across the six-yard box and found an unmarked Bailly in the fourth minute, but the United defender’s diving header hit the woodwork with the goal at his mercy. Captain Valencia was then forced from the field three minutes later with an apparent calf injury and replaced by out-of-favour full-back Matteo Darmian. The warm conditions slowed down the tempo, though Sanchez almost made the breakthrough with a free-kick which sailed just wide of the post before half-time. San Jose – who have collected the least amount of points in MLS this season as they sit adrift in the Western Conference – caused United some nervy moments, none more so than in the second half. Valeri Qazaishvili found the ball at his feet inside the penalty area approaching the hour-mark but a certain goal was denied by the sliding Timothy Fosu-Mensah, who made a terrific clearance off the line. Fellow substitute Tommy Thompson was the next to go close for the Earthquakes, the American midfielder forcing a fine save from Lee Grant with 20 minutes remaining, while the woodwork denied San Jose during the closing stages. Email “Alexis Sanchez returns as Man United held by MLS side”. Feedback on “Alexis Sanchez returns as Man United held by MLS side”.